The classic killer of the 80's created by Wes Craven is back now with a modern touch on its mythos. 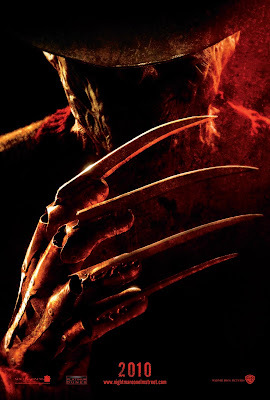 Freddy Krueger returns with his red-and-green striped sweater apparel, signature fedora hat and four-bladed gloves. But this time Freddy will be played by the Academy Award Nominee Jackie Earle Haley known to his performance in "Little Children" and the unforgetable character in "Watchmen", Rorschach. The film is being directed by award-winning music video and commercial director Samuel Bayer (Nirvana’s “Smells Like Teen Spirit,” Green Day’s “Boulevard of Broken Dreams”), marking his feature film debut. Of course the movie is nothing without the cast that Freddy will eventually hunt on their Nightmares. The casts includes Kyle Gallner (“The Haunting in Connecticut”), Katie Cassidy (“Taken,” TV’s “Supernatural”), Rooney Mara (“Urban Legend: Bloody Mary”), Thomas Dekker (“Terminator: The Sarah Connor Chronicles”), and Kellan Lutz (“Twilight,” upcoming “The Twilight Saga: New Moon”). The supporting cast also includes veteran character actor Clancy Brown (“The Shawshank Redemption,” “Highlander”) and Connie Britton (“Friday Night Lights”). After 25 years, Warner bros. will attempt to relive Freddy Krueger's fame through a remake that will reinvent everything and create a brand new nightmare that anyone will never want to have. Set to premiere on Summer of 2010. Watch out, for Freddy is back with a Vengeance.